They're here, they're clear, and people didn't get used to it. 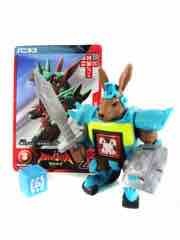 Aljaylo Burst is part of the third and final series of blind-boxed figures from this line, and he came at three per shipping case of 24 figures. He's a lot like regular Aljaylo, minus paint and opacity. The weapons and plastic form are virtually identical. The 1980s and 1990s were packed with toys remembered fondly by today's adults thanks to a large amount of marketing and a ton of print. Things like Bunikis and Beast Saga are probably going to be remembered by a few Japanese kids and American toy bloggers - nobody else seems to have much memory of this line already. 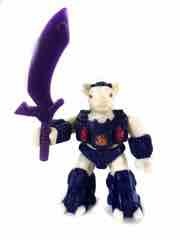 I was hoping for a huge line that eclipsed the original Battle Beasts. While we got a few awesome figures, it fizzled out quickly - but hey, we got a rabbit! I can't believe it, but Buffam has been sitting on the edge of my photo studio waiting for me to review him for over two years. 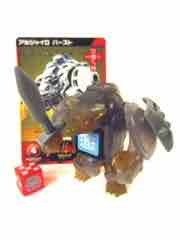 I bought the entire figure line - blind boxes and all - because man, was I excited about Battle Beasts. 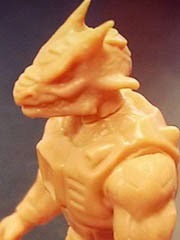 Diamond Select's new line petered out after a wave, the Armorvor has had only one beast head added since its introduction, and Beast Saga died in about a year. It didn't get ported to the USA, and it didn't really achieve much of an impact - it's doomed to obscurity, so it's time to write about this bull. Have a cow, man! The Bodacious Bovine came out as part of an eight-pack. It's a cow, but udder-ly devoid of feminine characteristics. You're going to love this. Marty delivers his figures fast. 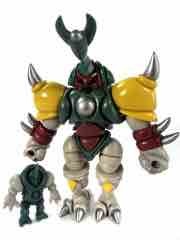 I placed an order on April 25 for Kabuto Mushi Hunter Mushi - it was in my hands April 30. He is amazing. His figures are really good too - since most are new colorways of a pretty good mold, and I've been trying to cut back on armies, I only get these very rarely... this Boba Fett-inspired figure came out in a batch resembling Skeletor and other familiar faces. How could I refuse? Clear with more paint! 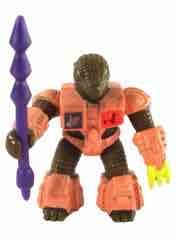 The Neo Granthan Pyrotellica is an orange release that looks like it probably owes a little bit - OK, a lot - to Micronauts. The previous Armorvor toys have rarely been clear, and those that have only had a tiny bit of paint. This is the first one to have painted faces on clear plastic, making it unique for a variety of reasons beyond merely being a new color with a newish head sculpt. Seemingly fans didn't jump on this one, because it didn't sell out quickly and actually stuck around along with his brothers beyond the point that the orders actually began to show up. It's still available as of my writing this, which is odd for a generally popular mold. He's green! 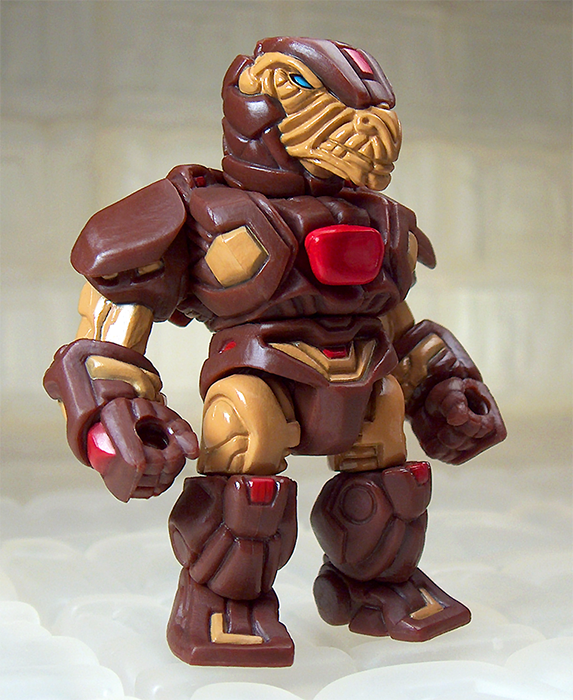 The Glyos-powered Rise of the Beasts line is pretty fantastic, although it's hard to view them purely as wholly their own thing. 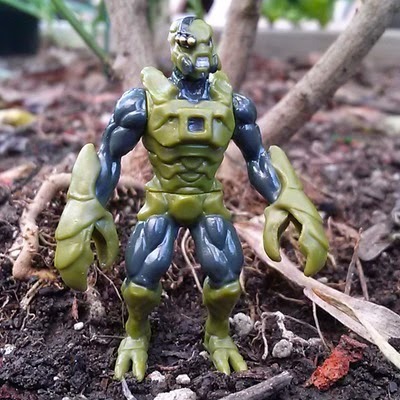 I keep expecting to see squat little guys, but Cerula - Green Scorpion with Grey Paint is more of what a small figure of the 1990s might look like, rather than the 1980s. The overly-muscular creature is fundamentally the same as Cahriv except for the coloration. The name is evocative! 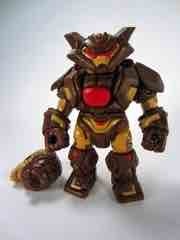 The Neo Granthan Cliffstalker is a brown, chocolate-flavored take on the Battle Beasts-inspired Glyos figure. With an orange skin and a red Black Core, this feels like many of the popular 1980s robotic toys out of Tomy. While not a perfect match, it immediately reminded me of Robostrux mixed with a little bit of the ever-lovin' blue-eyed Thing. He is orange with blue eyes, after all. 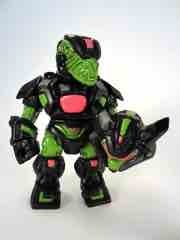 While the name (and an unhelmeted hand-molded head) existed for a while, the mass-produced mold is new here! One of three releases, the Neo Granthan Vrylless marks the replacement of the wolf headed Armorvor in favor of a dinosaur-headed Granthan. 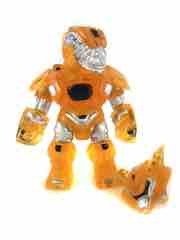 Two other figures hit at the same time, each of which use the classic Armorvor body with a new head. The wolf helmet head is still here, and you get 18 total parts as always. He's different! Or at least, mine is. 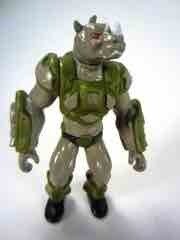 I was lucky to get an early sample of Rise of the Beasts Bal Kharn - Green Rhino with Grey Paint is pretty fantastic. If you bought the first version, this is basically an improvement in terms of color - the quality of that painted black plastic release is impossible to match, but this one is still quite good. It's live! 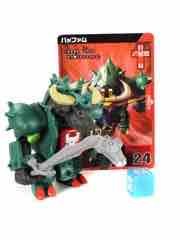 The Little Rubber Guys store has a new drop of 4 Rise of the Beasts figures! 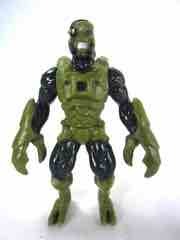 Unpainted figures are $4.00, painted (pictured) are $7.00. The drop is earlier than planned, as I managed to request/beg for early samples and let me tell you - they're great. You'll see a review here next week but if you can't wait, go ahead and grab some painted guys while you can. They're pretty fantastic! 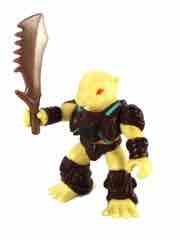 The Onell Design Armorvor - previously a wolf figure inspired by the Battle Beasts - has been redesigned! A new trio of figures are live now at their store called Neo Granthans. 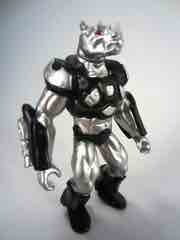 Black, Brown, and silver armored figures are on sale right now at $10.00 a piece, but most of the run has already sold through. Good news, everyone! Over on Instagram, New Rise of the Beasts 3D printouts are there for the seeing. A horned lizard (shown) looks incredible alongside an ant, a lion, and an ape. No release date has been listed, but fear not - a new, green drop of the rhino and scorpion are due soon and they're pretty dang fantastic. (Also, sitting on my desk.) Stay tuned for more, including weapons! O nameless beast, from you we can know the great secret of the universe! Maybe not - but I will say that the Rhinoceros - Silver Mail-Away Redemption is a low-run mail-in freebie cast in metallic black PVC and painted exceptionally well. He has no name of his own, and the figure itself is basically the grey painted one with silver swapped out - and man, is it pretty. I work mostly in a basement so it's darker down here and the silver positively glows. The reflective paint looks sharp. Who ya gonna call? These guys! 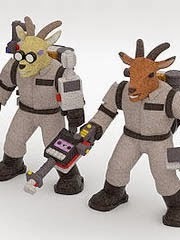 Combat Creatures continues the 80s parody creature figures with a new entry over on Shapeways. You're going to dig the Ghoatbusters - a four-pack with Bray, Bleater, Angon, and Winshorn. The four-pack is surprisingly cheap - only $50 for the set. 16bit.com Update Summary: April 22, 2019 - Star Wars questions answered! An ad for new Spider-Man, Toy Story, Aladdin, Spider-Man, and Overwatch! We get a piece of every purchase you make from our sponsor through this link. If you were going to buy something, click here first and it helps fund the site! Thanks for your support!